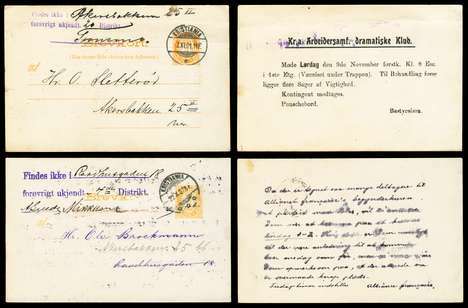 Supplementary Markings: Group of two 1897-1901 3 øre postal cards OFK #bk40 (printed matter rate), sent within Kristiania, bearing violet 2-line handstamps "Findes ikke i __address__ / forøvrigt ukjendt __disrict number__ Distrikt / __signed__". While the text of the two markings is the same, the type font and size is different. Interestingly, the two cards are addressed to men with different last names and... the 1897 card was not found at the address, but a new address is penciled in. The 1901 card is addressed to the second (new) address of the other card, but the addresse was not found there. One card is a drama club meeting announcement. The other appears to be a meeting announcement, something having to do with a French subject; the method of reproduction appears to be an early form of a ditto machine (quite unusual). This type of supplementary marking is very seldom seen -- such undelivered mail was often eventually discarded.